The project, which received €935,000 in MINECO’s 2017 Retos Colaboración call, will focus in its first phase on two of the most common solid tumors in children and adolescents, rhabdomyosarcoma and neuroblastoma, as well as in lung and colon cancer, which have the highest mortality rate in adults. 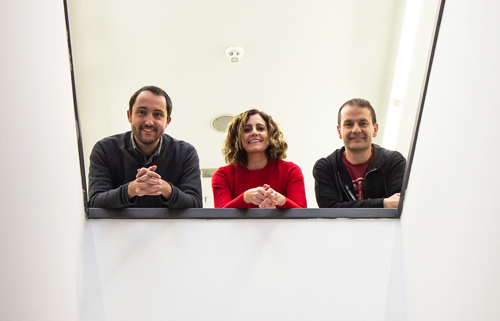 Researchers from IBEC’s Cellular and Molecular Mechanobiology group, led by Pere Roca-Cusachs, discovered that the binding of proteins talin and vinculin – triggered by mechanical forces exerted by cells in response to an increase in rigidity of the surrounding tissue – triggers the activation of an important oncogen called YAP, present in most solid tumors. The results of the research – published in Nature Cell Biology in 2016 – revealed that the inhibition of the interaction of both proteins prevents activation of YAP, and has the potential to slow down, stop or even reverse tumor growth. The year-long project, “Development of an innovative therapy for the treatment of solid tumors by means of the inhibition of the mecanotransduction”, has received a grant of € 935,000 euros from the Ministry of Science, Innovation and Universities through of the call Retos Colaboración 2017 of the ‘Programa Estatal de I+D+i Orientada a los Retos de la Sociedad’ (Exp. RTC-2017-6505-1).